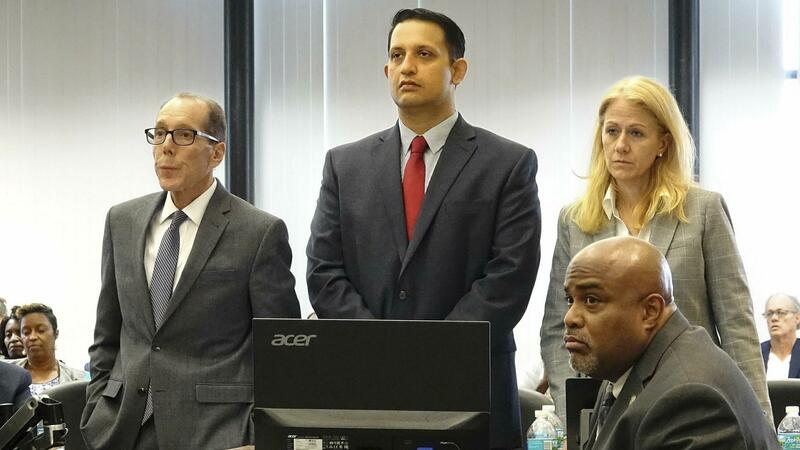 In West Palm Beach, Fla., today, a jury convicted a former police officer in the fatal shooting of a black man back in 2015. This is the first time in 30 years that an on-duty officer in Florida has been convicted in a shooting. NPR's Greg Allen has details. And a warning to our listener, his - to our listeners, his story contains sounds of gunshots that some may find disturbing. GREG ALLEN, BYLINE: Corey Jones was a housing inspector and part-time musician who was on his way home from a nightclub in October 2015 when his van broke down on I-95 in Palm Beach Gardens. He was on the side of the road in his SUV when he called for roadside assistance. MADDIE TOLLIVER: What can I do for you tonight? COREY JONES: I need to get a tow. ALLEN: Jones was on the phone with dispatcher Maddie Tolliver. That's when Palm Beach Gardens officer Nouman Raja, dressed in plainclothes, wheeled his unmarked van the wrong way down an exit ramp, stopping just feet from Jones's van. On a recording of that phone call introduced as evidence at the trial, Raja is never heard identifying himself as a police officer. In the recording, the door to Jones's SUV is heard being opened. And he tells Raja, I'm good. Using an expletive, Raja tells him to get his hands up and begins shooting two seconds later. ALLEN: Prosecutors say Jones left his vehicle and began running. On the recording, 10 seconds go by, and Raja is heard firing three more shots at Jones, killing him. Jones had a permit to carry a concealed weapon. After he was killed, investigators found it more than 100 feet from his body. It hadn't been fired. The city of Palm Beach Gardens fired Raja from his job as police officer. At the trial, prosecutors said Raja's aggressive behavior and the fact that he didn't identify himself as a police officer led Jones to believe he was going to be robbed or carjacked. The defense maintained that Raja had identified himself as an officer and that when he approached the SUV, he saw Jones holding a gun and acted in self-defense. After five hours of deliberations, the jury convicted Raja on two counts - manslaughter and attempted murder. Outside the courtroom, Corey Jones's father, Clinton Jones, spoke to reporters. CLINTON JONES: It was a long process, but we endured. And today we have justice. ALLEN: Corey Jones's death in 2015 was one in a series of confrontations that resulted in the deaths of black men at the hands of police officers. It came a year after Michael Brown's shooting in Ferguson, Mo., and Eric Garner's death in New York. Following Corey Jones's death, there were marches and protests in Palm Beach County. Outside the courthouse today, State Attorney David Aronberg thanked Jones's family and the community for its patience while prosecutors pursued the case. DAVID ARONBERG: Hopefully today can provide a measure of justice and closure to the Banks and Jones families and to our entire community. There's been an open wound in our community, and hopefully that can begin to heal. ALLEN: Aronberg called Raja's actions an aberration that shouldn't tarnish the contributions of officers who, in his words, work day and night to keep our community safe. Raja will be sentenced next month. He faces a mandatory minimum sentence of 25 years in prison with the possibility of life. Greg Allen, NPR News, Miami. (SOUNDBITE OF DARKEL'S "ONE MILLION OF YEARS") Transcript provided by NPR, Copyright NPR.